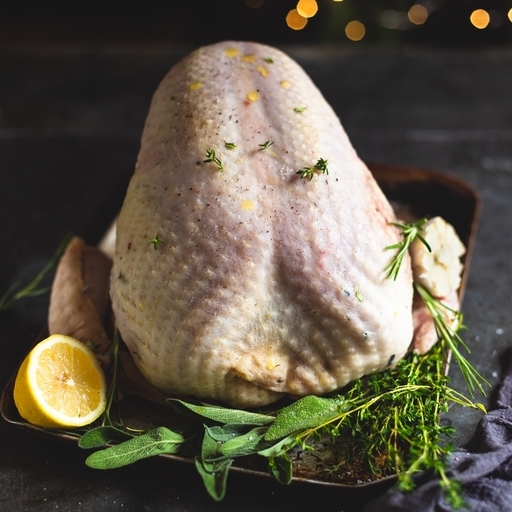 Our traditional Bronze turkeys are slow grown, organic and free range, for juicy meat that’s full of flavour. This crown has the entire breast, with just the wings for a small amount of dark meat. Quick to cook, easy to carve – it’s a fantastic alternative to a whole turkey. Feeds 9-10 generously with plenty of leftovers (300g of cooked meat per serving), minimum weight 3kg. Remove from the fridge at least half an hour before cooking. Rub with a little plain oil and season with salt and pepper. Roast at 200°C/Gas 6 for 20 mins, then 20 mins per kg at 180°C/Gas 4. Make sure the juices run clear. Test with a skewer – if the juices run pink, return to the oven for a further 10 mins then test again. Repeat as necessary. Rest for 30 mins before serving.